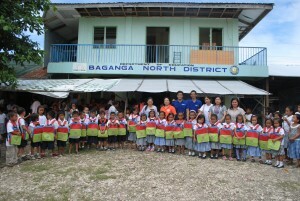 Bangaga’s Lambajon Central Elementary School located at Davao Oriental. 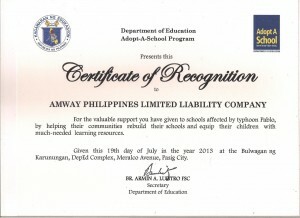 Amway Philippines received a certificate of recognition from The Department of Education’s Adopt a School Program. Just a few weeks before Christmas last year, disaster struck in Mindanao. Typhoon Bhopa, locally called Tropical Storm Pablo, was declared a category 5 super typhoon that left more than 1,000 people dead and roughly 80,000 homeless. Davao Oriental was one of the most damaged areas. Hectares of coconut plantations were uprooted, resulting in lost livelihood for locals who depend on farming. Fear, hunger and chaos spread across the area like the darkness that enveloped them on the night that Pablo took away not only their homes but the lives of the people they loved. Just a few weeks ago, an Amway Philippines One by One Campaign team traveled six hours to demonstrate the “Bayanihan” spirit (sense of community or fellowship) at Bangaga’s Lambajon Central Elementary School located at Davao Oriental. Some 300 colorful One by One Campaign school bags packed with school supplies and food were delivered to new primary students. The school, whose library was razed to the ground, also received 150 storybooks to continue bringing values-laden stories to children and help them forget the trauma of disaster. In honor of the commitment to this and other projects for local schools, as well as a commitment to help rebuild communities devastated by Pablo, Amway Philippines received a certificate of recognition from The Department of Education’s Adopt a School Program. Amway also renewed its commitment by entering into a 5-year partnership that will propel efforts far into the future: one school at a time, one child at a time, one by one. Thanks to Michelle Ochoa and Rex Lalata for sharing this story.